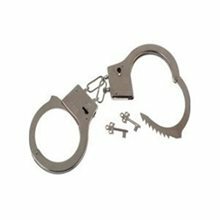 Chain 4 Way Cuffs.Includes: One set of 4 way chain cuffs.Dimensions: Neck bands measures 23 inches with velcour, wrist and ankle bands are open closure and measure 13 inches. 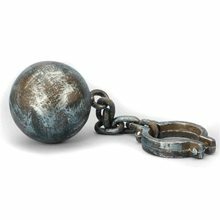 Chain full front length measures 48 inches and leg and arm chains measure 13 inches.Great affect chain is made of foam with lightweight plastic bands. 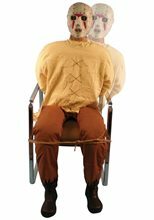 A great addition to any prisoner costume! 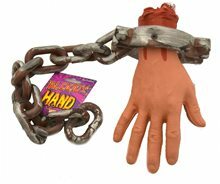 Chain links your wrists, neck and ankles together. *Costume and Shoes Not Included. 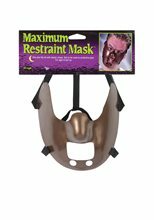 Maximum Restraint Mask.Includes: One Maximum Restraint Mask. Available Size: One Size Fits Most Adults and Teens. *Costume Not Included. Accessories Sold Separately. The plastic face mask is sure to give you shivers. 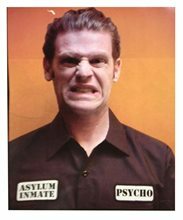 Combine with a psycho ward restraint costume and you will have the perfect crazy felon costume. American psycho face mask.